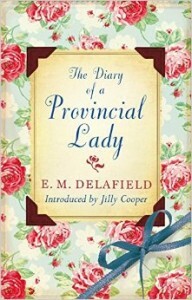 The Provincial Lady, whose name is never mentioned, lives in Devon, England in the early 1930’s. This is her diary, which spans almost a year–from November 1929 to October 1930. She spends her time mostly with social obligations, such as the Women’s Institute and neighborhood fetes and fundraisers. Her household consists of a quietly authoritative husband, a beloved son who is away at boarding school much of the time, and a six-year-old mischievous little girl–along with her French governess. There’s a surly, argumentative cook, and other staff in and out of the story, as well as several friends and acquaintances of various personalities. The theme is the running of the tightly budgeted household while the Lady fulfills her social duties, and tries to get a holiday here and there. The most interesting aspect of the story is that it was written in the 1930’s, and so it’s completely accurate as to the details. Much of the wording is unfamiliar, with references to place names, brands and such. The governess’s quotes are almost entirely in French and with no translation or context clues reduces the reader to Googling the passages (if interested enough), though I should point out that there is an annotated version of this book, which most likely offers the English translation. I was greatly put off by the mention of drowning unwanted kittens, so if you find this offensive, it could ruin the book for you. Historically, before spaying and neutering, this was thought to be a painless procedure. I found some information on it here. I think if the main character had shown a bit more grief about the kittens, it wouldn’t stick out as much as it did. If you can overlook the untranslated French and the animal cruelty, it is a quick, witty read. There are many instances of laugh-out-loud hilarity, and the Lady has a great sense of humor. When I first started the book, it reminded me strongly of the Bridget Jones’s Diary series–not just because it’s in diary format–but the sentence structure/style is similar. I’d recommend it for those interested in the lives of the upper class in early 20th century England. There are several sequels to this series, including The Provincial Lady in London, The Provincial Lady in America, I Visit the Soviets, Provincial Lady Goes Further, and The Provincial Lady in Wartime. There is an inexpensive e-book collection, but I’ve read several comments that it is riddled with spelling errors.